Screamed the older woman to the group of middle schoolers playing football in the middle of the astroturfed field house. The field house was the University of Rochester’s Goergen Athletic Center. The tweens – both boys and girls – were members of various Lego robotics teams. The woman was a coach for one of the teams. Apparently, her concern involved something about the potential of a football crashing into someone’s fragile plastic robot – a potential never realized despite the footballers ignoring her plea. But, think about the setting before you off-handedly flip the page. “Hey! 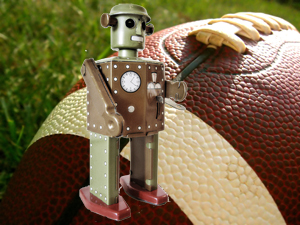 You’re not supposed to do that!” Implied in this complaint lays the prejudice of many: Robot engineers aren’t supposed to like, play and, especially, excel at sports. Yet, here we had these renegades, satisfied with their mechanical creations, willingly and ably playing not just any sport, but the sport of football. Sure, we might have accepted soccer, a delicate game long ago sissified by minivan driving moms, but football? How can this be so? Here’s my theory: Video Games. No matter how uncoordinated you might think you are, nimbleness of thumbs and fingers can make you a Madden superstar. Sooner or later, that virtual confidence somehow translates into a physical desire. And, given the extreme realism in today’s games, it’s increasingly easy to visualize moving just the right muscles to make that big play. Don’t underestimate the power of visualization. Remember “be the ball”? It works. And it works for these kids. I know at least one of them actually plays real football for a real team. But I can see how others of those vagabond gridiron robo-athletes could make a roster. Jocks beware. Geeks, thanks to video gaming, are quickly closing the sports gap. Or is it video gaming that is closing the gap between geeks and jocks?